"The menacing Block-O who dreams of conquering the universe leaves his planet, Planet Cube, in search of his next target. Unexpectedly, Block-O discovers that the inhabitants of Earth like to give out gifts. 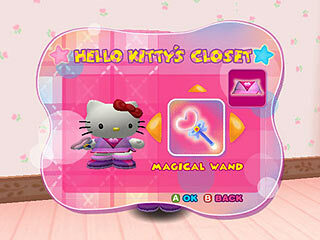 Once the gifts are received, gift boxes are usually thrown away. Misinterpreting the gift box as his beloved kind, Block-O resentfully dispatches troops to invade Earth to win justice for his fellow cubes." 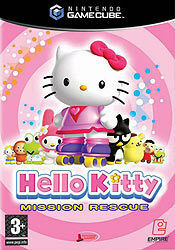 "- More than 20 popular Sanrio characters including Badtz-Maru, Mimmy and Keroppi. 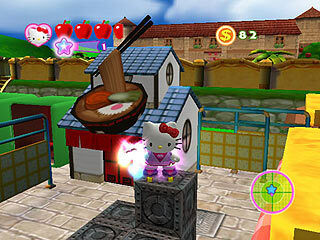 - Kitty can select a partner to help her fight enemies in various stages. 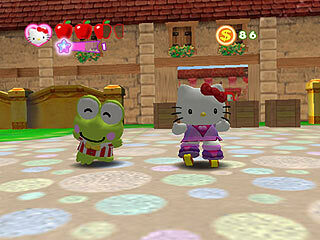 - Sanriotown is a completely 3-D world, with brilliant colors and an interactive environment. 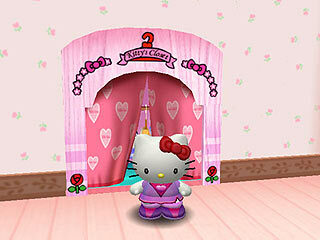 - Time based-seasons greetings from Sanrio characters will be sent to players. 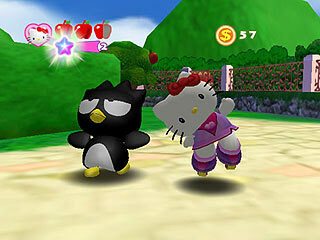 - Five game levels varying in difficulty and ways to completion."